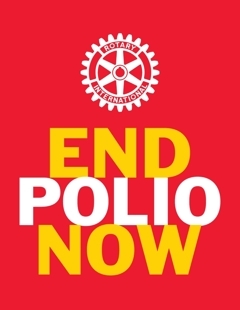 The time to end polio is now and the Rotary Club of Oak Bay invites you to come help us out in this quest. Tomorrow between 11am and 2pm, we are holding a hotdog BBQ on the front lawn of the Oak Bay Municipal Hall in the Oak Bay Village. The hot dogs and coffee are all “sold” by donation, with all proceeds going to the PolioPlus project of Rotary International. Thanks to our generous sponsors: COBS Bakery for the buns, Fairway Markets for the wieners and condiments, and Level Ground Trading for coffee. Also thanks to the Municipality of Oak Bay for declaring February 23rd Rotary Day, letting us the lawn of the municipal hall’s lawn, and raising the Rotary flag, as well as to the Inter-Cultural Association of Greater Victoria for providing us with a tent in the case of inclement weather. Hope to see you there! Managed to finally get to the Tea Party today, after being quite busy yesterday. 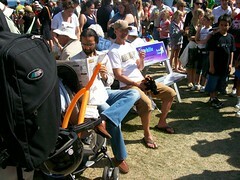 Even though I arrived after 3 and after the airshow, there were still tonnes of people there. I did see large numbers streaming up Estevan Rd to their parked cars on Musgrave and nearly all the streets between there and the water. But then again, I don’t blame them for driving. The bike parking situation at Willows Park is quite abysmal, even on non-busy days. 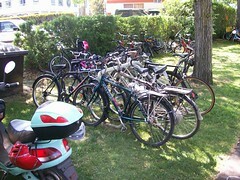 There is exactly one bike rack there, as can be seen to the left. It was full. This meant that bikes spilled out and where parked everywhere. When I arrived, I ended up having to raft my bike up with a very nice gentlemen by the name of Terry who was similarily looking for a spot. 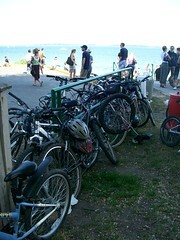 We ended up parked near the toilets, right near the giant mess of bikes seen below. You can see the rest on in my 2009 Tea Party flickr set but there was one other picture that amused me. That was this one of two bikes locked to an Oak Bay Works flashing sign. 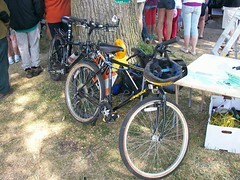 Hopefully for next year, there will be more bike parking. Maybe if we get organized soon enough, Safer Cycling Oak Bay and/or the Community Association could get the portable racks that Chain Chain Chain have. It would be nice if Shooting Star Amusements could provide bike parking as well, just like they provided the lone bench seen below.